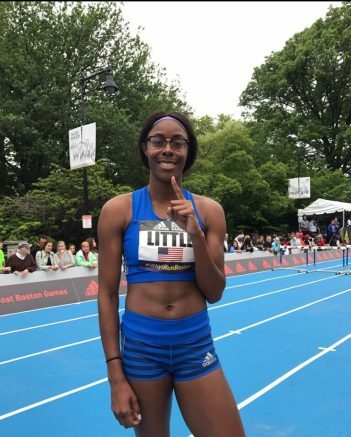 4th June 2017 – Former World Championships silver medallist Shamier Little (USA) continued with her excellent season to date at the Adidas Boston Boost Games over the weekend. Racing for the first time in a ‘street meet’ where her event was a straight 200m hurdle race, Shamier adapted superbly and crossed the line first in 26.00 seconds. From here Shamier moves on to the Racers GP in Kingston and will again be looking to lower her PB. In Europe there was some solid runs over the middle distances for PACE athletes. After a couple of injury laden years Andrew Osagie (GBR) continues to make strides forward and he placed third over 800m in Andujar in a World Championhips qualifying time of 1:45.75. Not far behind was Michael Rimmer (GBR) in 1:46.89. Bethwel Birgen (KEN) was fourth over 5000m in Montreuil and training partner Vincent Kibet (KEN) was third over 1500m in Marseille, clocking 3:35.46. Also in Marseille, it was great to see a return to action for Perri Shakes-Drayton (GBR) when taking sixth place in the 400m. Finally Steph Twell (GBR) completed a competitive training session at the Watford Open that saw compete in mixed races over 1500m and 3000m, running 4:07.39 for the former, followed by 9:00.04 for the latter less than an hour later.